Mad Hippie Vitamin C Serum – Looking for a natural & gentle no-sting alcohol-free Vitamin C serum that’s also budget-friendly? You’ve got to try this one from Mad Hippie skincare! It packs a punch with a combination of Sodium Ascorbyl Phosphate (a more stable and bioavailable form of Vitamin C), Ferulic Acid (a natural antioxidant that reduces UV generated skin damage), Vitamin E and Hyaluronic Acid. I love its ultra-lightweight, liquidy texture that absorbs super quickly leaving a smooth, non-sticky base for your moisturizer with SPF. Amarté Ultra Veil Sunscreen Broad Spectrum SPF 50+ – This facial sunscreen ticks all the right boxes for me! It combines effective sun protection with an elegantly lightweight texture & feel plus non-sticky, matte finish without any white cast. Its anti-inflammatory and antioxidant ingredients bring more anti-aging benefits and it works beautifully under makeup too. Drunk Elephant T.L.C. Framboos Glycolic Night Serum – This is a natural exfoliating treatment that does what it says, and does it well! With a blend of glycolic, lactic, tartaric, citric and salicylic acids, it has a silky gel texture that’s not at all sticky or greasy and absorbs very quickly. It refines and resurfaces skin gently, unclogs pores and adds radiance back to dull lacklustre skin, without the harsh side effects. Think of it as an at-home, irritation free version of those costly professional facials or peels! HydroPeptide Solar Defense Broad Spectrum SPF 30 – I love this tinted moisturizer for its easy-to-apply, lightweight formula which includes broad-spectrum sun protection with only physical sunscreen actives (titanium dioxide and zinc oxide). The natural-looking, satin matte finish is beautiful, and its light tint helps even out skin tone beautifully and blurs minor imperfections. Pricey, yes—but I think it’s worth the splurge! Perlier Honey Miel Royal Elixir Face Youth Serum – This anti-aging serum is just as luxuriously decadent as it sounds! The serum actually has a very lightweight, silky lotion consistency that absorbs super quickly while adding a subtle, healthy glow. I also love mixing this serum with my foundation for a healthy radiance without any extra shine…it works beautifully to perk up my dull and tired skin! It Cosmetics No Tug Waterproof Gel Eyeliners – Truly one of the best long-wearing eyeliners I’ve ever tried! Not only are these eyeliners beautifully pigmented, the ultra-smooth budge proof formula is waterproof and won’t smudge, run or fade all day long. But the best part is that the color doesn’t run out of the waterline either…my search for the perfect eyeliner for the waterline is over! Mary Kay True Dimensions Lipsticks – This lipstick is a winner on all fronts with its creamy wear and highly pigmented formula. Even better, it fades to a beautiful stain and comes in a great range of shades from flattering nudes to bold reds and everything in between. Infused with a nourishing blend of ingredients such as sunflower seed oil, jojoba and mango butter, they have a rich, creamy-smooth texture with a semi-gloss finish that looks and feels great on lips. Perfect to pamper and add a pretty pop of color to your pout! Mirabella CC Crème – This CC creme is truly the Crème de la Crème! I love its flawless, medium-full coverage that somehow still feels lightweight and looks natural, lasting all day without fading away. It’s the perfect alternative for those of us who don’t like using foundation for everyday makeup and need a one-step complexion perfecting product with skincare benefits to boot! It also includes a few oil controlling ingredients to help keep shine at bay (great for oily and combo skin). It Cosmetics CC+ Lip Serum Hydrating Anti-Aging Color Correcting Crème Gloss – Of all my lip glosses, I find myself reaching for this most often! Not only does it have a lightweight, non-sticky, super hydrating and creamy formula but this luxurious gloss also packs a good deal of pigment with a lovely, soft shine finish. Mirabella Faerie Collection – Yes, I have another favorite from Mirabella! 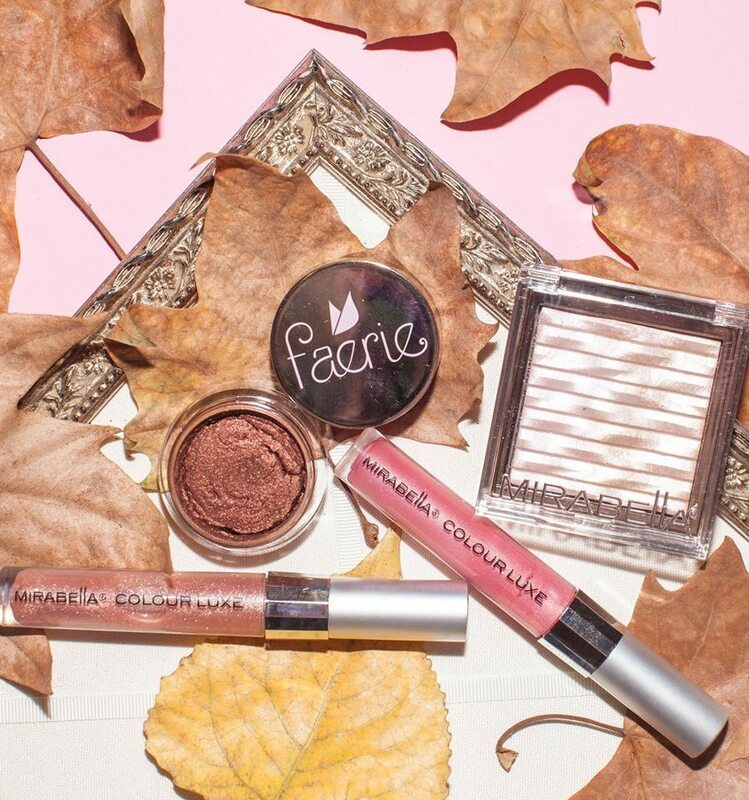 Faerie is a gorgeous four-piece collection with a mix of amber & copper tones and soft warm pinks. It includes a long-lasting eyeshadow, a mineral-based highlighter and two high-shine lip gloss shades accentuated with subtle shimmer to create a romantic, ethereal look. The standout product in the collection for me is the Myth Visionary Long-wearing Eyeshadow that features a bronzy reddish brown hue with a rich color payoff. 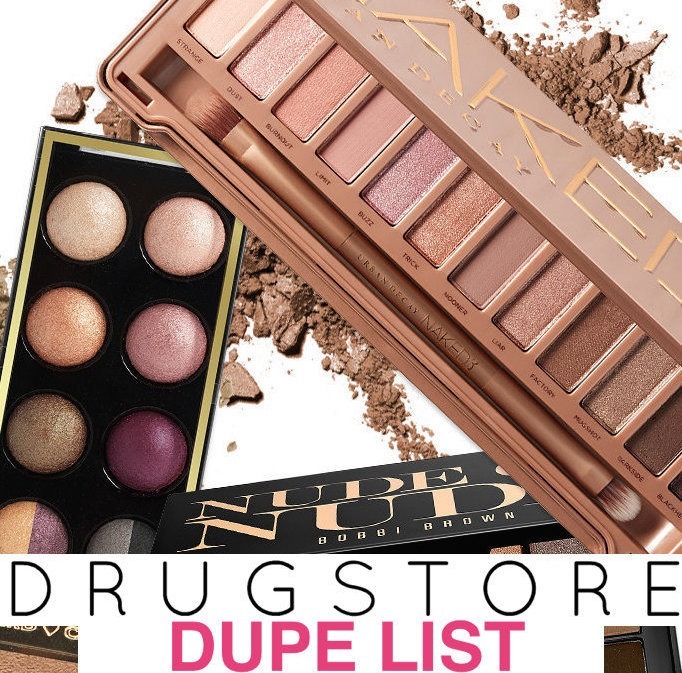 I love the silky texture of the eyeshadow – don’t really have anything else like it! Herbal Essences Naked Cleansing Conditioner – This is a super affordable (just $5) dupe of the awesome-but-super-expensive WEN cleansing conditioner!! Free of sulfates & parabens, it does a great job of cleansing hair without weighing it down and leaves it super-soft and healthy looking. If you love WEN, you’ll love this! Palmer’s Shea Formula Moisture Repair Curl Shampoo & Conditioner – Yay for another drugstore haircare favorite! If you are looking for a budget-friendly sulfate-free shampoo (but not a cleansing conditioner), this duo is the perfect pick! While this nourishing range has been specifically formulated to care for curly hair, it’s also a great choice for dry/damaged, wavy and color treated hair like mine. Although free of any nasty sulfates, the creamy shampoo formula lathers really well and removes dirt & buildup without stripping hair. What an awesome review! Thanks for sharing! beautybyarielle Glad you liked it! EbonyJayBeauty It is pretty good…give it a try!